Johnnie Walker is the story of a brand that started as a humble grocery at Scotland and became one of the best selling whisky company in the world. 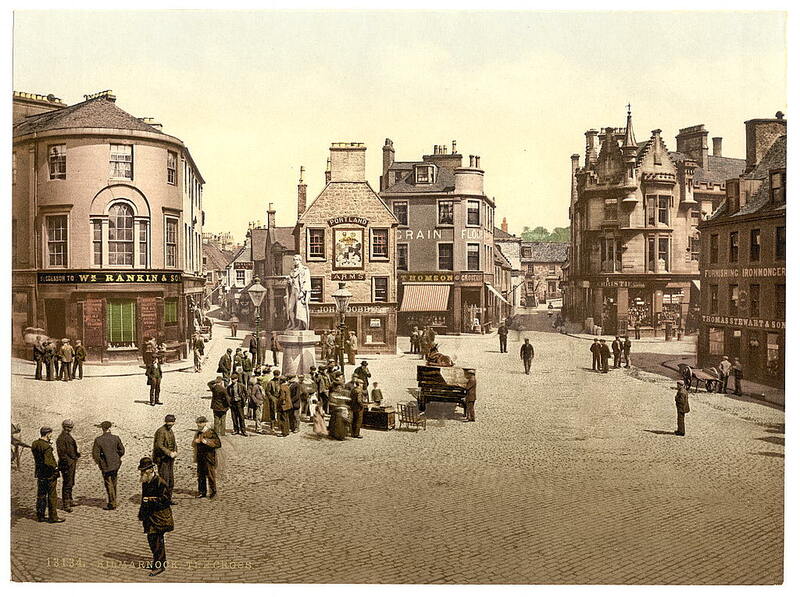 John Walker, born in 1805, was a shopkeeper at Kilmarnock, in Ayrshire, Scotland. He founded his grocery in 1819 with only fourteen years. 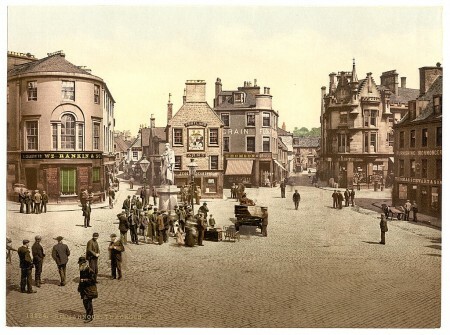 John Walker managed to sell almost everything, even his own whisky, under the Walker�s Kilmarnock Whisky, which was surely a single or blended malt, as blended whisky was forbidden up to 1860. In 1843, with the arrival of the railway at Kilmarnock, John and his son Alexander realize the potential of the train for their enterprise. In 1860 they decide to use squared bottles, that remains an icon of the mark, together with the slanted Johnnie Walker label, that is inclined 24 degrees. Having squared bottles was good because they stock in less space and there were less broken bottles. Five years later, Alexander Walker create their first blend. Each type of blend: Old Highland Whisky, Special Old Highland Whisky and Extra Special Old Highland Whisky, had its label of a different color. Alexander so renamed each bottle according to their label color in 1909. Just year before, Tom Browne, a cartoonist, created during a meal the striding man, that has become the icon of Johnnie Walker to nowadays. More expressions were introduced, in 1920, Johnnie Walker Gold Label was created and it was a special blend given only to the most successful directors of the brand and in 1932 Johnnie Walker Swing, a blend which bottle was specially created for ships so that the bottle would swing with the movement of the waves. In 1934, King George V gave the Royal Warrant, one of the highest distinctions in the United Kingdom. In 1966 they obtained too the Queen�s Award for export achievement. In 1991, they created Johnnie Walker Premier, a blend of malt and grain whiskies with many of them from closed distilleries. In an attempt to gain the premium market they created the Johnnie Walker Blue Label, that although it is non age statement whisky, contains many old whiskies some of them from already closed distilleries. Expanding the firm, Johnnie Walker Gold Label was introduced in 1995 and Johnnie Walker Green Label in 1997, which is a blended malt. In 2008, they created the Johnnie Walker Blue Label King George V, that contained whisky from oak casks that date of the period of king George V, the one that gave the royal warrant to Johnnie Walker. Now, Johnnie Walker is part of Diageo, and they no longer blend the whisky at Kilmarnock. 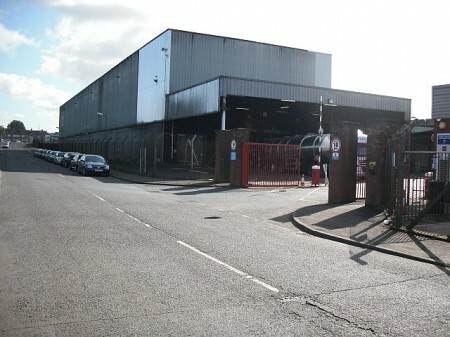 Also Diageo announced that they were moving what remained of the production out of Kilmarnock too. There are two great ideas that whisky world is in debt to Johnnie Walker. One is the fact of using square bottles instead of round ones, and the second is to sort their whiskies using color labels instead of ages or other names. 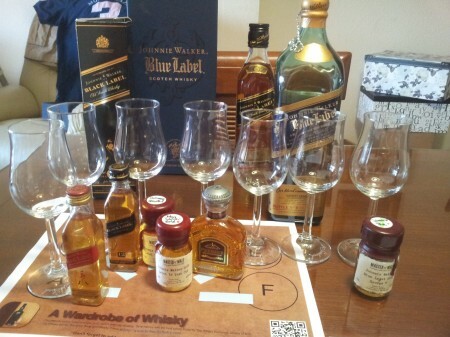 Overall, except Red and Black, Johnnie Walker are nice whiskies but slightly expensive. Red Label tastes very artificial with a nice vanilla nose that soon turns to something unpleasant. And well, I am still disappointed with Black Label as a sign of luxury. 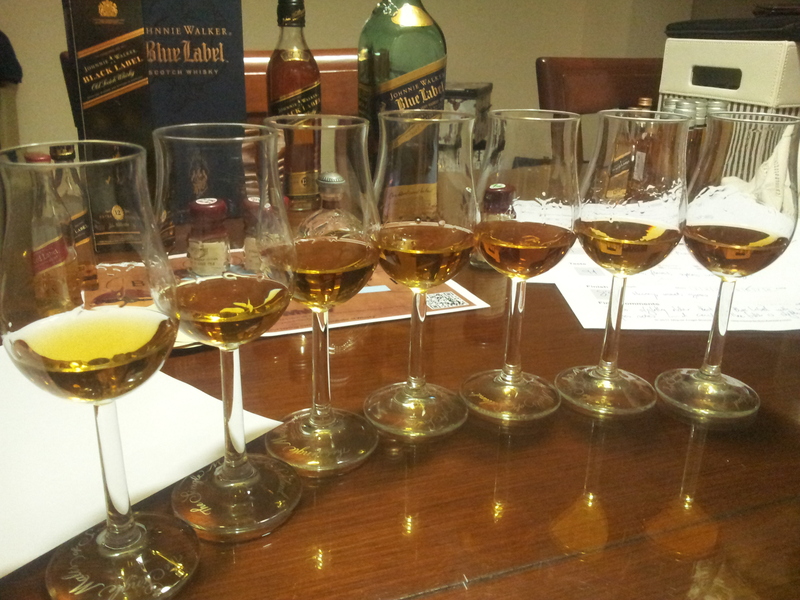 From left to right, Johnnie Walker Red Label, Black Label, Green Label, Gold Label, Premier, Blue Label, Blue Label King George V.
One of the world's most popular blended whisky. This Red Label from Johnnie Walker is a full bodied smooth whisky that stands over other brands. Or so they say. The actual fact is that the brand that build itself over great quality whiskies is right now just selling booze. If you are still drinking this whisky I suggest you give a try to a better whiskies in the same price range as those in the Bang for the buck list of whiskies. Nose (88): average. honey, floral, spices, wood, vanilla. Not bad, I would swear Red Label was a hell worse than this. So based on other whiskies I have already tasted I rate this Johnnie Walker's Red Label with 86 points over 100. Johnnie Walker set the standard to follow in scotch blended whisky with their Black Label. Johnnie Walker Black Label whisky is made of up to 40 malts and grain whiskies , all of which are at least 12 years old. The final blend is a combination of Speyside whiskies, like Cardhu with a fair amount of smokier Talisker to produce a whisky that is characterful, smooth and high in quality. If you like Black Label, I suggest you give a try to Johnnie Walker Green Label that, although a bit more expensive, is a totally different and better experience. Nose (83): average. honey, wood, fruits, apples, vanilla. Palate (86): smooth, oily. honey, smoke, wood, spices, fruits. Finish (86): average. honey, smoke, wood. So based on other whiskies I have already tasted I rate this Johnnie Walker's Black Label with 85 points over 100. The pure malt amongst the Johnnie Walker 'family', bottled at 15 years old. A great gift malt, and a good, sweet but hearty malt with bags of character. The lead malts in this are Talisker, Linkwood, Cragganmore and Caol Ila. Perhaps the best value whisky in the Johnnie Walker range of blended scotch whiskies. This whisky is now know a blended malt and it is going to be discontinued in 2013, so do a good stock of it while you can! Nose (87): more than average. honey, fruits, citrus, salt, vanilla. Palate (88): powerful, oily. honey, spices, pepper, wood, citrus, peaches. Finish (88): average. honey, spices, salt. So based on other whiskies I have already tasted I rate this Johnnie Walker's Green Label with 88 points over 100. A superior deluxe 18-year-old blended Scotch from Johnnie Walker. This blended whisky is made from an exclusive selection of fifteen different aged whiskies. The blend delivers an exceptionally smooth taste together with a richness of character and lasting finish. If you like this whisky, you better start stocking it as Diageo is going to discontinue it. Nose (85): weak. honey, citrus, vanilla, spices. Quite light nose. Hello? Someone there? Palate (89): smooth, oily. honey, peat, wood, smoke, vanilla, spices. Light peat punch, umm, that's better. Finish (88): longer than average. honey, peat, spices. So based on other whiskies I have already tasted I rate this Johnnie Walker's Gold Label with 87 points over 100. A rare and exclusive blend constructed from the most precious of Johnnie Walker's vast stocks of long-aged malts, some of which are from now-silent distilleries and can never be replaced. A discontinued blended whisky that from time to time spot on some shops. Nose (88): more than average. honey, spices, cherries, red fruits, cinnamon. Smells like a Blue Label finished in a wine cask. Palate (89): smooth, oily. honey, wood, spices, fruits, vanilla. Finish (89): average. honey, spices. So based on other whiskies I have already tasted I rate this Johnnie Walker's Premier with 89 points over 100. Johnnie Walker Blue Label is their rarest blend. Blue Label is created from the rarest and most expensive whiskies in the world, this iconoclastic scotch whisky has the authentic character and flavour of a traditional nineteenth century blend, just like those that John Walker and his son Alexander developed for their most valued customers. At the heart of Blue Label is Royal Lochnagar, a rare malt distilled near Balmoral, the Queen's holiday home. Around 15 other mature and precious whiskies are added to balance Blue Label perfectly - 'a blend that cannot be beat', (Alexander Walker, 1888). Don't get me wrong. It is a great whisky, but for that price you can buy better single malt whiskies. Nose (89): more than average. honey, spices, fruits, cinnamon, vanilla. Palate (91): powerful, oily. honey, smoke, spices, floral, citrus, cocoa. Finish (90): longer than average. honey, wood, spices. So based on other whiskies I have already tasted I rate this Johnnie Walker's Blue Label with 90 points over 100. A new extension of the Johnnie Walker range for travel retail, this celebrates the first Royal Warrant granted to John Walker and Sons Ltd to supply Scotch whisky to the British Royal Household in 1934, and is apparently designed to recreate how JW might have tasted back in the day. Some Port Ellen has been used, alongside Cardhu, Lochnagar. Nose (90): more than average. honey, spices, vanilla, floral, wood. Palate (91): powerful, oily. candies, floral, spices, wood, ginger. Finish (89): longer than average. honey, wood, spices. So based on other whiskies I have already tasted I rate this Johnnie Walker's Blue Label King George V with 90 points over 100. Johnnie Walker has to kind of whiskies overpriced ones and overmarketed ones. With the great exception of Green Label, the rest of the range is either weak or very expensive. And they have decided to replace the 15 years old Blended malt whisky that Green Label is for a NAS bottle this year. So my advice is stock 15 years old Green Label and give a try to single malts like Talisker and Cardhu that are in the very heart of Johnnie Walker whiskies making.